With all the options available today finding a stylish suit look can feel overwhelming, but Dress for the Day is here to walk you through some of the best styles, as seen on some of the world’s best dressed athletes. With all the options available today finding a stylish suit look can feel overwhelming, but Dress for the Day is here to walk you through some of the best styles, as seen on some of the world’s best dressed athletes. You can learn more about style by visiting the Men’s section of Dress for the Day or downloading their mobile app. You can also check out previous editions of the style guide for more sport-influenced style. 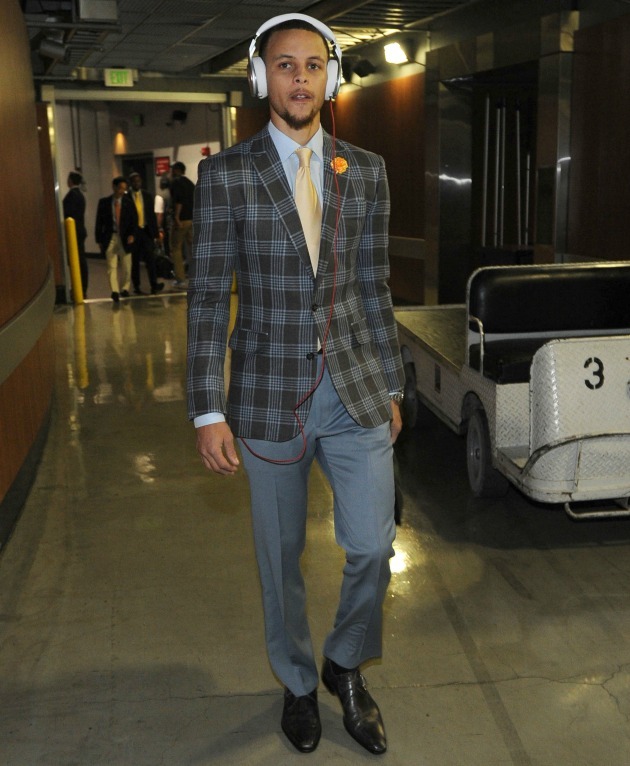 The greatest shooter in NBA history and can rock a suit looking this good? Day-um. As is said time and time again, it’s Steph Curry’s world and we’re just living in it. Until life decides to throw us a bone, we can at least try and emulate his Warrior style. Let’s start with that statement-making plaid blazer, similar here. It’s just the right mix of contemporary meets preppy. Add a golden yellow tie and a fun lapel pin. Pair with a light blue button-down shirt like this or this. Keep things simple on the bottom with some gray slacks and classic black oxfords. Don’t forget some headphones so you can play your hype music on repeat. Your jump shot may never come close to his, but who cares when your fashion game is #ftw. 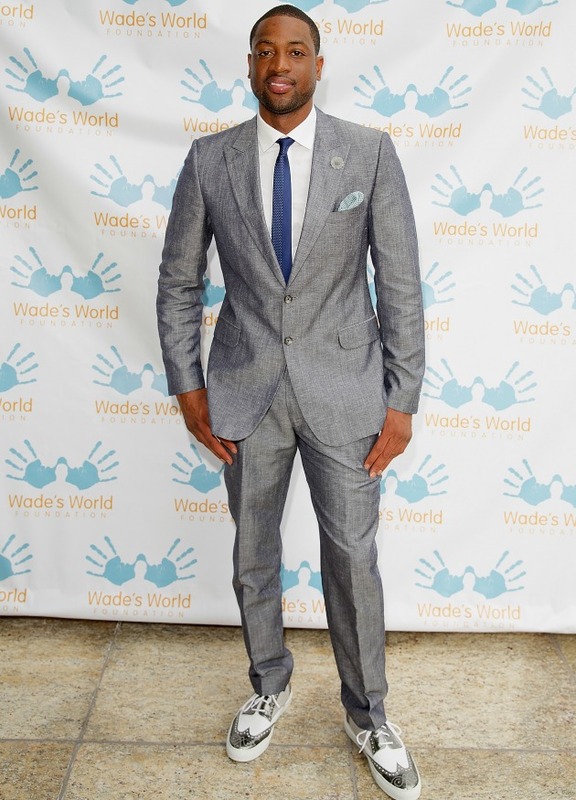 Speaking of basketball royalty, Dwyane has been bringing the heat this season and we’re equally impressed with his unique choices when it comes to suiting up off the court. To get his look, invest in a grey suit like this, which can be worn to work, a wedding or wherever you’re trying to dress to impress. Accessorize with a skinny blue tie and light blue pocket square. A plain white button-down shirt will round things off. And now, for those shoes! Stay on trend with a pair of white, wingtip sneakers like these or these. Have we mentioned how lucky Gabrielle is to have such sweet arm candy? Derek’s look here is a perfect example that a well-tailored, dark-colored suit goes a long way. And you don’t even need a tie or pocket square to look like a million bucks. Just accessorize with some dreamy blue eyes (or colored contacts) and a crisp white shirt like this or this. To get your footwear game as hot as Derek’s, we recommend investing in custom, hand-crafted shoes. Our friends at Awl & Sundry specialize in premium quality without the absurd price tag and their designs are some of the best we’ve seen. Some of our favorites include The Carmine, The Mahtab and The Naval for something really unique. Sidebar: can you say #relationshipgoals? Heading to a destination wedding in Mexico? Spending the day at a country club? Or just need an excuse to wear a summer suit? Like you, Colin’s fate is undetermined at the moment, but we can be certain that he’ll look stylish and suave wherever he ends up. Like Kaep, every guy needs a khaki colored suit like this or this in his closet. We love the look of pink accessories with a summer suit, like this tie and pocket square. Opt for brown lace-ups or loafers instead of black colored shoes and of course, for the ultimate cool-guy effect, finish the look with some aviator sunglasses. All that’s missing is an adult beverage in hand and Pitbull playing in the background for those tingly, summer feels.